Knight News is joining forces with the best nightlife venue in downtown Tempe — a three story mix of a high energy nightclub, sports bar, and live dueling pianos — to give UCF fans of all ages a place to gather together and celebrate another perfect season. 12.30.18 at 8 p.m. | RSVP HERE! We worked out a deal with the owners of three bars in the 5th and Mill building to open up early to welcome UCF fans on Sunday, December 30 starting at 8 p.m.
And because we know how expensive this trip was, there will be no cover. And you can save on drinks and get a free beanie by donating $10 to Knight News here. We’re also working with our friends at Knights Watch, and we’ll recognize the movement they are creating for Knight Nation. 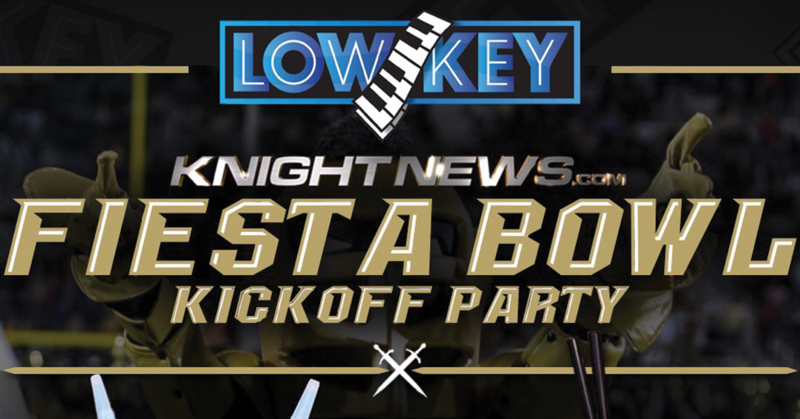 The Knight News Fiesta starts Sunday, Dec. 30 at 8 p.m. at Low Key Piano Bar. But don’t take the name too literally — it’s a piano bar with more energy than you’ve ever seen. Look for Low Key’s signature 40 ounce Long Island fishbowls and syringe jello shots. The bar is a favorite of the college crowd and working professionals looking for a good time with great music. And for fans staying near Glendale, they have a second state-of-the-art location that just opened within walking distance of State Farm Stadium. Next on our Knight News Fiesta bar crawl will be Varsity Tavern. 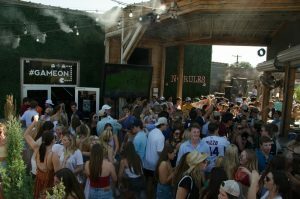 This TCU fan favorite just expanded from Texas into to Tempe, AZ, becoming the “epicenter of the eat-drink-dance movement” with its high-energy sports bar atmosphere, amazing food, nightclub, open-air space, and panoramic views of the famous Mill Avenue scene. We said there’s something for everyone — and this is your chance to show off and ride a bull! Stop three on our Knight News Fiesta is the Rodeo Ranch. 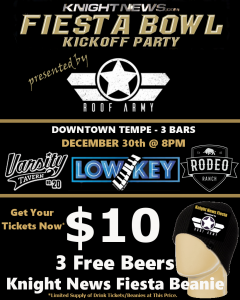 Check out the video below that shows you what the late night crowd can look forward to with other UCF fans Dec. 30 in Tempe. We’ll give 5️⃣winners a free drink ticket at our #KnightNewsFiesta Kickoff in #Tempe! Check out the bull you can ride in the video of 1 of the bars on our crawl! If you’re looking for a New Year’s Eve spot that is going all in for UCF Knights, then come back to 5th and Mill to ring in 2019. They have options starting as low as $10 per person if you book ahead, and those who want to celebrate in style can buy bottle service in its night-club style venues. Visit the links to the venues above for more info. Low Key’s Westgate Location will be another Knight News headquarters for UCF fans planning to get together and celebrate after the big win. This location is right by the stadium, a quick walk – and a great time – with the latest technology to make the experience even better. We will be giving away gift cards and have more about this event soon. Keep checking back!